Richard Kimball and his wife Ursula Scott were among the brave, or crazy, men and women who left their homes in England, traveled in a tiny ship across a massive ocean, and faced incredible odds to establish a new homeland. Traveling with them were their seven children, Richard's brother Henry Kimball and his family and Ursula's brother Thomas Scott and his family. This family group sailed from Ipswich, England in April of 1634 landing in New England, possibly Boston, in July of 1634. This is what I know about Richard and Ursula Scott Kimball. Team Lawford/Mistley. Richard and his brother Henry were the sons of Richard Kimball of Lawford, Essex, England. Richard Sr. was a wheelwright as was his son Richard. In his will, proved 10 September 1619, Richard left his "eldest" son Henry all his "tools of his trade". Henry the eldest of the brothers is believed to have been born in about 1590 and Richard in about 1595. These dates are based on the information they gave about their ages on 30 April 1634 as they prepared to leave England. It is not known where the men were born, but it was probably Lawford or somewhere quite close by. Henry had several of his children baptized at the parish church of Mistley. Team Lawford/Mistley is championed by noted genealogist and author of the Great Migration Series, Robert Charles Anderson. Team Hitcham. Richard Kimball was the son of Henry and Johanna Kimball of Hitcham, Suffolk. Henry Kimball, the immigrant, was not his brother but a kinsman. There is no documentation that would prove Richard was the son of Henry and Johanna. There was only one baptism found in the records with the Kemball name and that was for Rachell d/o Henry and Johann of Rattlesden, no other baptisms have been found. Team Hitcham is championed by Roger Thompson, noted author of many books about the early immigrants to the Massachusetts Bay, including Mobility and Migration, and many Kimball descendants. The proximity of Hitcham to Rattlesden, home of Richard's wife, is about 7 miles. The distance between Lawford and Rattlesden is about 23 miles. Thompson says that the Kimballs of America can trace their ancestry to Thomas Kembold (c. 1525) of Felsham, Suffolk, about 5 miles from Hitcham. (I can't find any trees which have a Thomas Kembold in them) Anderson believes that geography and occupation clinch the deal. I have no idea which is correct and I don't know if it is an argument which can be resolved, but in either case Richard was probably related to all the Kimball's in the Suffolk/Essex region. Team Hitcham has assigned Henry and Sysley Kembold of Hitcham, who lived in a tenement he called Pogelle's, as the grandparents Richard. This Henry also had land in Rattlesden. Henry wrote his will in January 1558 and it was probated in March of the same year. Henry named his wife and eldest son Henry as executors, this son Henry must have been over twenty one at the time, so he would have been born around 1547 or so. Henry Sr. also make bequests to younger sons Thomas and Richard who had yet to reach the age of 21. The son Henry is the one who married Johanna. Is it possible that the son Richard was the Richard of Lawford who died in 1619? I have seen many tree and websites that list Henry and Sisley as the parents of the immigrants Richard and Henry, but this is impossible for what should be obvious reasons. Team Lawford/Mistley This option is a bit twisty and I had a hard time following it, but here is how it goes. Henry Kembold who died in Hitcham in 1558 was married to a Cecilia, Celcilia sounds a lot like Sysley to me. Anyway, he had a son Henry who married, not Johanna, but Margaret Munning of the village of Brettenham, which borders Hitcham. She was the daughter of Humphrey Munning and Ellen Ungle. 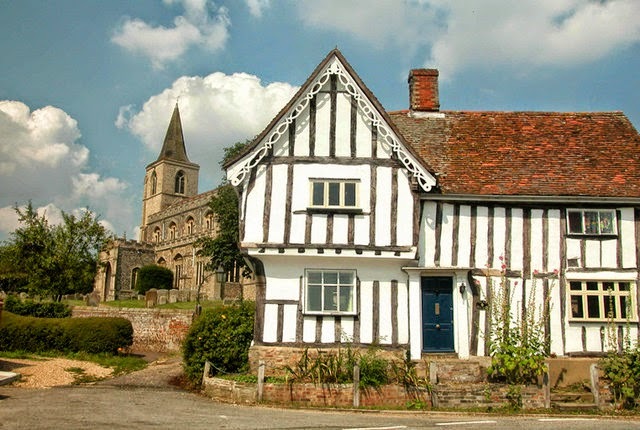 They were married in Brettenham on 12 June 1564. Henry died in 1583, Margaret's death is unknown. This Henry and Margaret were the parents of Richard, born in 1565 in Brettenham, he married Elizabeth Unknown and they were the parents of the immigrant Henry and Richard. On another website the line is given as Henry and Cecilia, Henry and Margaret Munning, Henry and Johanna, Richard and Elizabeth and finally the immigrants Richard and Henry. This line has added an extra generation which included the Henry and Johanna of team Hitcham. This option cleverly combines the family of Hitcham with the Lawford/Mistley. There are some problems with this ancestry though. 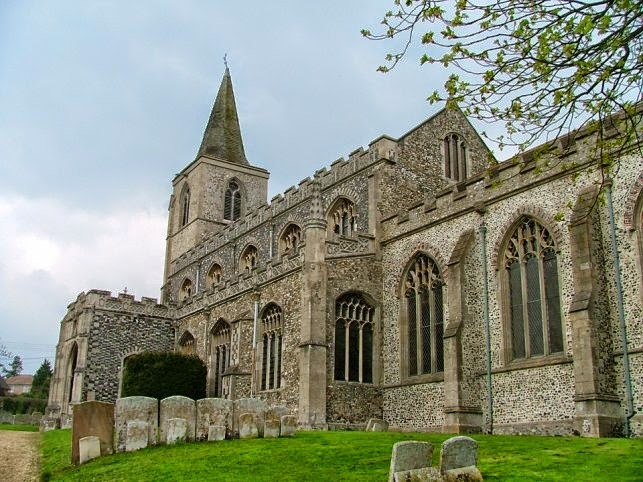 The Brettenham parish records don't start until 1584 some twenty years after Henry Kimball married Margaret Munning. I have no clue where this information comes from. Richard Kimball married Ursula Scott, daughter of Henry and Martha Whatlock Scott of Rattlesden, Suffolk by 1615. Unlike Richard's family, her ancestry is rather uncontested. 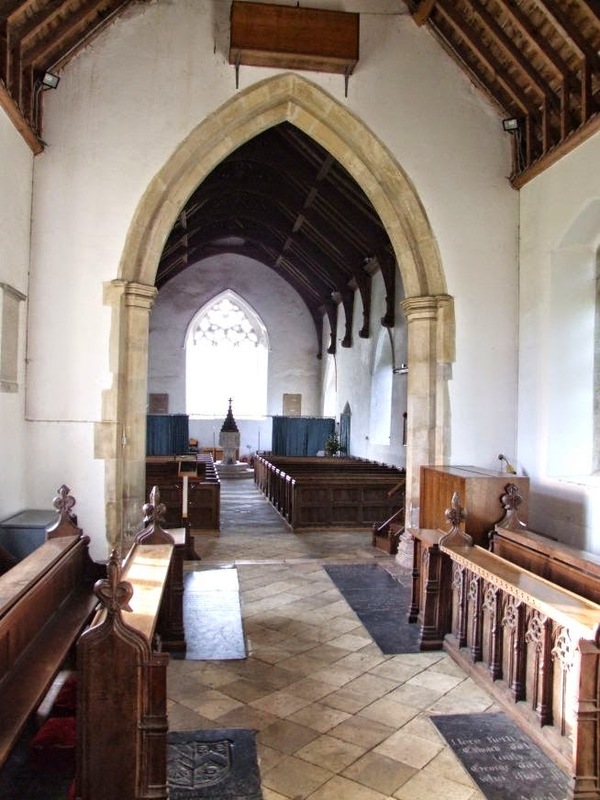 Ursula was baptized 14 Feb 1597 at the church of St. Nicholas, the parish records recorded her as Ursuley, daughter of Henry and Martha Scoote of Rattlesden. Henry Scott identified himself as a yeoman in his will but his son Thomas was a glover. According to Roger Thompson, the Scotts descended from a long line of farmers and leatherworkers, and could trace their ancestry back to John Scott of Felsham whose will was probated in 1475. "Item I give unto Martha my well beloved wife, the house wherein I now dwell with the apprtenances and all my lands and grounds both free and copy thereunto belonging and appertaining during the term of her natural life, and after her decease to Roger my son and his heirs forever. Item I give unto Abigale Kemball my grandchild forty shillings to be paid her or her heirs or assigns at the age of one and twenty years Item to Henrie Kemball my grandchild twenty shillings to be paid at 21 to Elizabeth Kemball my grandchild twenty shillings to be paid at 21 to Richard Kemball my grandchild twenty shillings to be paid at 21". To Thomas Skott £5 within one year after his decease. To Rev. Peter Devereux of Rattlesden 10 shillings. Proved 10 Jan. 1624/5. Henry Scott, Ursula's father, was the son of Edmund and Joan Scott, he was baptized on 1 Nov. 1560 at Bradfield St. George, Suffolk. Edmund and Joan Scott most likely lived and married in Bradfield St. George as they had their first children baptized there. Sometime before 1566 they relocated to Rattlesden where the rest of their children were baptized. Edmund performed various duties for the parish of St. Nicholas in Rattlesden including Church Warden, Questman (parish officer) and as a collector. Joan Scott was buried in Rattlesden on 15 May 1615 her husband Edmund was buried on 14 August 1621. 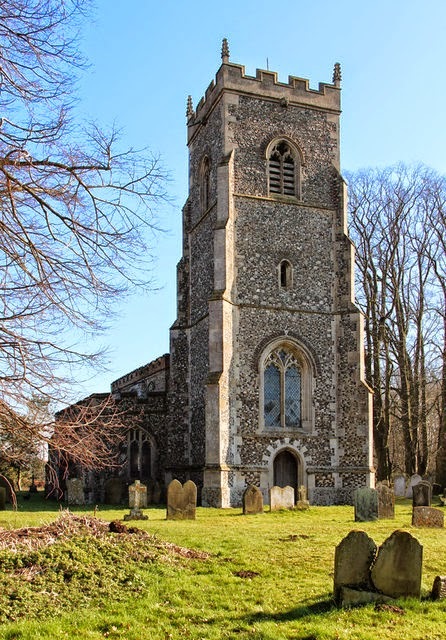 On 2 Oct, 1547 George Scott of Bradfield Saint George, county Suffolk made his will. He asked to be buried in the churchyard of Bradfield. He gave to the high altar 5s. To Margaret, his wife £40 and ten milk neat and his two copies for her life and all household stuff. And after her decease Edmund his son to have the best copy and George my son the next. He gave to each of them ten marks of good and lawful money of England and two milk neat cattle. To Isabell Scott his daughter 20 marks and two milk cows. To Nicholas Scott, his son, his house in Hegsted after the decease of his (George's) mother, and twenty combes of barley, five combes of wheat and five combes of rye. To his mother one combe of mystlyn and one combe of barley. To each of his son Nicholas's children five combes of barley and a milk cow payable at age 21 or at their marriage. Each godchild received two bushels of barley and every servant taking wages one combe of barley and to every one not taking wages two bushels. He gave to William Wyatt his blue coat, to Nicholas Scott his best marble coat, to Thomas Swanton his sleaved russett coat and his [ ___ ] coat and one combe of rye. At day of his burial he gave £4 for charity, at thirty days another £4. He made Margaret his wife and Nicholas his son to be executors. His master Sir Thomas Jermyn to be supervisor. Witnesses Richard ___, priest, James Chapman and Robert Scott. Proved 10 February 1547/8. 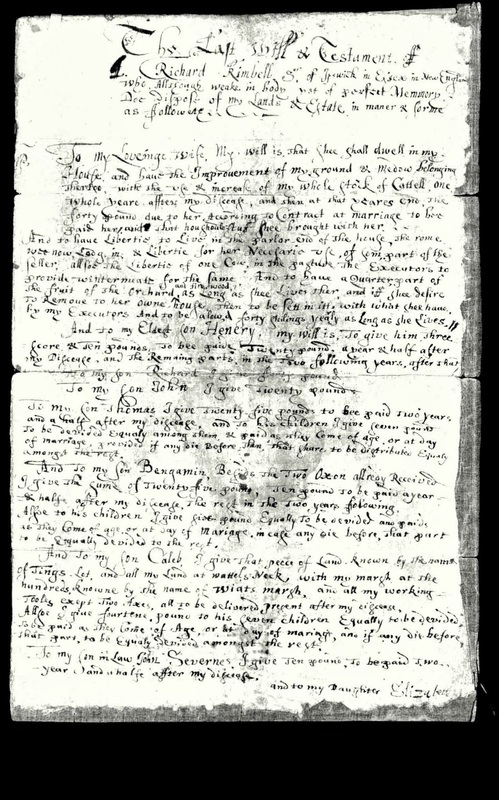 17 May 1607 - the will of Thomas Whatlock of Rattlesden, knacker . . . all household stuff to Joan Wahtlock my wife . . . to Henry Skott £6 to be paid at Michaelmas after my wife’s decease . . . to Martha my daughter £6 likewise . . . to Thomas Skott the son of Henry Skott £6 at age 21 . . to Roger Skott the son of Henry £6 likewise . . . to Ursula Skott the daughter of Henry £6 likewise . . . these children in tail to each othere . . . £4.4 per year to wife for life . . .the residue to my sons Roger and Robert Whatlock, they to be executors. Witnesses: John Moore, John Bowker and William Samon. Proved 30 January 1608/9. 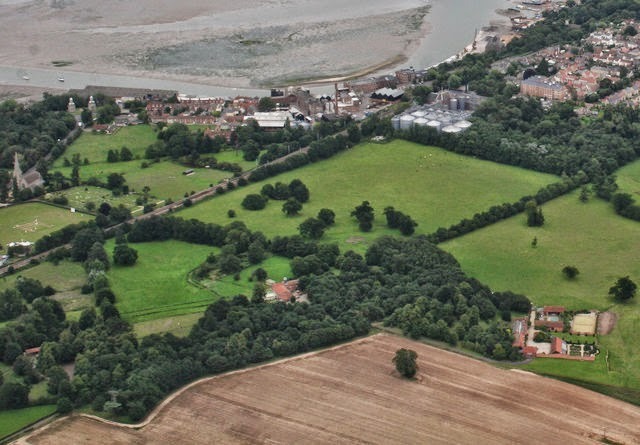 The Stour Valley in Essex, England was a hotbed of radical Puritan belief. Many of the Great Migration Colonist came from the surrounding counties. Lawford/Mistley is just a hop skip and a jump from the Stour River. In 1634 the Kimball/Scott families joined the flow of colonist crossing the Atlantic Ocean in search of a better life, either for religious or economic reasons, and in many cased both. Prior to embarkation, most colonist took an oath to remain loyal to England and her church. 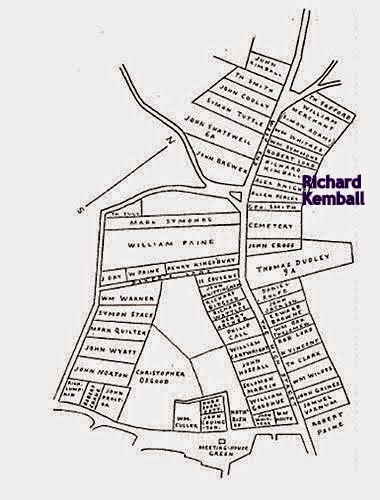 Richard Kimball and his group took their oath in Ipswich, England on 30 April 1634. With him was his wife Ursula, and the following children: Henry (15), Elizabeth (13) Richard (11), Mary (9), Martha (5), John (3), and Thomas (1). Richard's oldest daughter Abigail had married John Severance in England. He was master of the ship The George, which supposedly also brought colonist to Massachusetts but I cannot find any documentation on the ship or passengers. Abigail and John eventually settled in Salisbury, MA. Henry Kimball and his family also took their oath that late April day, as well as Thomas Scott, Ursula's brother. Some of my other ancestors were on board the ship The Elizabeth with them, including Thomas Hastings and his family. The Atlantic crossing was unpleasant at best, but all the Kimball's arrived safely in Massachusetts in July. After a brief stay in Boston, both Kimball families, the Scotts and the Hastings settled in Watertown. Richard was granted a homestall of six acres in what was then Watertown but is now in Cambridge. The land was just to the south east of Fresh Pond, probably on what is now called Huron St. He was also allocated land in five other land divisions, accruing quite a lot of acreage. Richard and Ursula also accrued a few more children after their migration. She gave birth to Caleb, Benjamin and Sarah, their births were not recorded in any records so their birth years are estimated as 1635,1637, and 1639, as it was typical for a woman of child bearing age to give birth about every two years. Richard was a member of the church of Watertown, he took his Freeman oath on 6 May 1635. By 1637 Richard had made the decision to leave Watertown and move his family some 40 miles to the north to the town of Ipswich. Why did he leave? Was there not enough work as a wheelwright for both he and his sons? His oldest son Henry by then about 21, did not make the move to Ipswich, but remained in Watertown. Watertown was quickly running out of land, Richard might have moved so that his younger sons would have a better shot of getting land of their own. 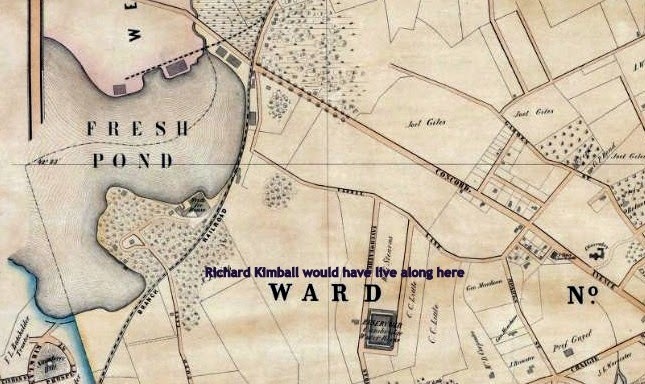 In any case the town of Ipswich granted to Richard Kemball a house lot at the west end of town, and shortly thereafter granted him 40 acres of upland, north of the river. Ursula's brother Thomas Scott also relocated to Ipswich. 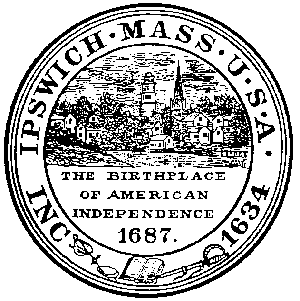 Like all the new towns and settlements in Massachusetts, Ipswich called upon it's male citizens to take on the business of running the town affairs, whether it be as a selectman, constable, hog reeve, fence viewer or any of the many jobs that needed to be done to ensure not only order but the survival of the town. Richard was chosen multiple times to fulfill various town roles. He was part of a committee that dealt with delinquent "fellers of trees", apparently a problem in many of the new towns. He assisted the lot layers with the land grants. And he was chosen to be a selectman. Richard's name also appears on estate appraisals for the probate court. Richard also acted as executor of his, brother in law, Thomas Scott's estate. Today, most people believe that the Puritans were stodgy, uptight, and well, puritanical. The truth is they were a cantankerous, litigious, and ornery bunch of people. Richard was no exception. The first time his name is recorded in the Essex County Court records, it is for an offense committed by two of his sons, Thomas and John. Appearing in court, held at Ipswich on 13 Sept. 1649 were Joseph Fowler, who was married to Martha Kimball, Thomas Scott, Thomas Cook and the Kimball boys. The were charged with carrying liquor and fire into the woods at an unseasonable time of the night, this action was apparently accompanied by much shouting and singing. Sounds a lot like a bunch of good ole boys getting drunk and having a good time out in the woods. In 1650 Richard himself is presented in court in what seems to be a convoluted case. The files record a case of slander brought by Mr. William Payne against Joseph Fowler, followed by a second case against Fowler for stealing a hog, it was to be prosecuted by Robert Lord and Marke Simons, but was discharged. The next entry reads "there appeared jealously between Richard Kimball and Marke Simons and Thomas Harris and Joseph Fowler. Kimball and Fowler promise to pass by their offences and never trouble each other again." Prosecuted for appearing to be jealous! In 1651, Joseph Fowler, Marke Simons and the Kimball's are again embroiled in a court case involving a hog, accusation of lying and reproachful speeches. In 1652 Richard brought Richard Shatswell to court for trespass. Shatswell turned around and sued Richard for forfeiture of a bond. 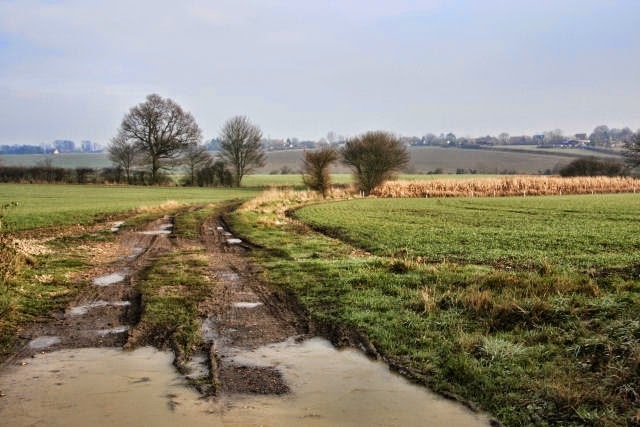 In 1656 Henry Kimball, Richard's oldest son, took Richard Shatswell and others to court for allowing their cattle to get into his field and eat or destroy his corn crop. Half the town seems to have testified in this case, some even saying that it was Henry's father and brother's cattle that destroyed the corn. 1658 saw the Kimball's in court again, testifying in a case against Richard Shatswell, obviously these men did not get along! This sparring with neighbor continued for years. Ursula, like most women of the age, is rarely if ever mentioned in any records. We know that Ursula died sometime before 1661 but her death went unrecorded. Richard remarried 23 October 1661 to a widow Margaret Cole Dow, he would have been about 67 years old at the time. They were married for about 14 years. 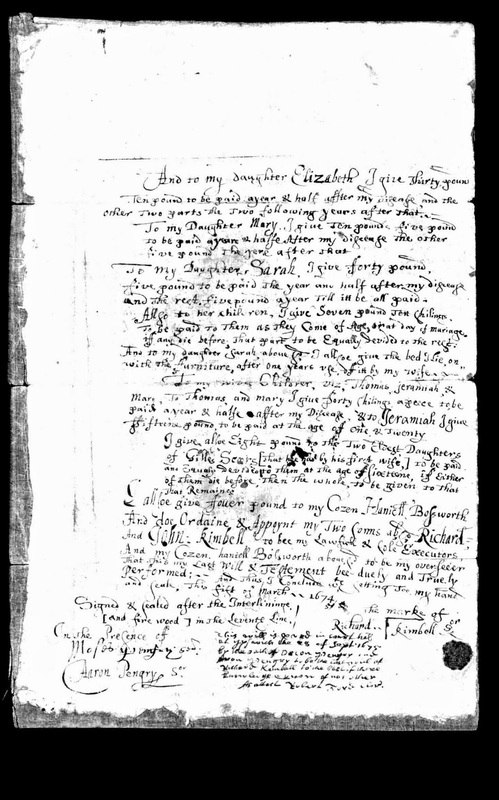 Richard wrote his will on 5 March 1674/75, it was proved that September. Margaret his wife lived only a short time longer, dying the following March. Richard died just prior to the 1676 war with the native Americans, known as King Phillip's War. Many of his family would suffer greatly during this conflict, losing their homes and their lives. Waters, Henry F., “Genealogical Gleanings In England”, New England Historical & Genealogical Register, Vol. 52, April 1898. 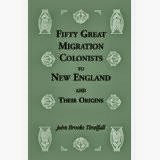 Threllfall, John Brooks, "Fifty Great Migration Colonist to New England and Their Origins", Madison, WI, 1990, pgs. 411-424.